Kurt Vonnegut is one of the most celebrated American authors. His works expand from novels, short stories and plays. His dark humor and satirical writing are what attracted me to picking up his book. My first read, of course, is Slaughterhouse-Five. 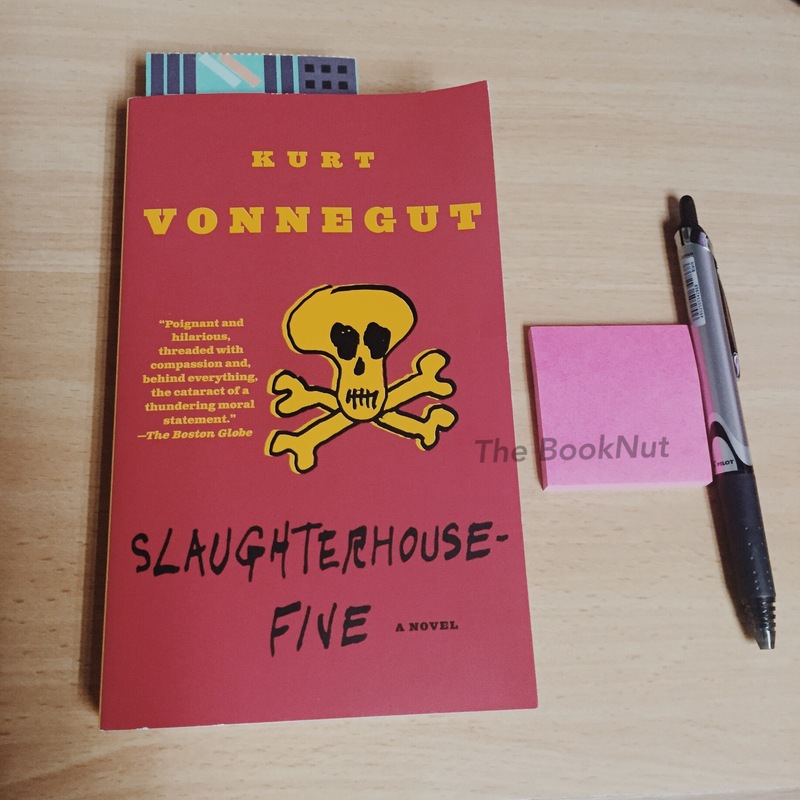 First published in 1969, the story is about Billy Pilgrim’s account of his life and his experience during the war, the Dresden bombing and what he did after the war. It tells the tale of a young man who was carted overseas to fight the war, his several brushes with death, his survival and the life he lived afterward. In between are tales of his time travels and flashbacks. Yes, you read that right, “time travel”. You see Billy Pilgrim has come unstuck in time, or so Vonnegut says. Vonnegut told a poignant story about the struggles and different facets of the World War II. He laced it hilarious chapters and colorful characters which would make you think that at some point in time, you may have met these certain characters in your real life. He told the story of life and death and of the things we are afraid to face or discuss. I particularly like the way he wrote about time and death. And how we humans viewed it differently from the “Tralfamadorians”, a character in Pilgrim’s story. I like that their concept of time is viewed in one continuous moment, no beginning, no middle and no end. I also found it fascinating that in the novel, whenever Billy Pilgrim mentions a death of someone or something, it is always followed by the phrase “So it goes.” though I completely forgot why, but it makes an interesting part of the read. 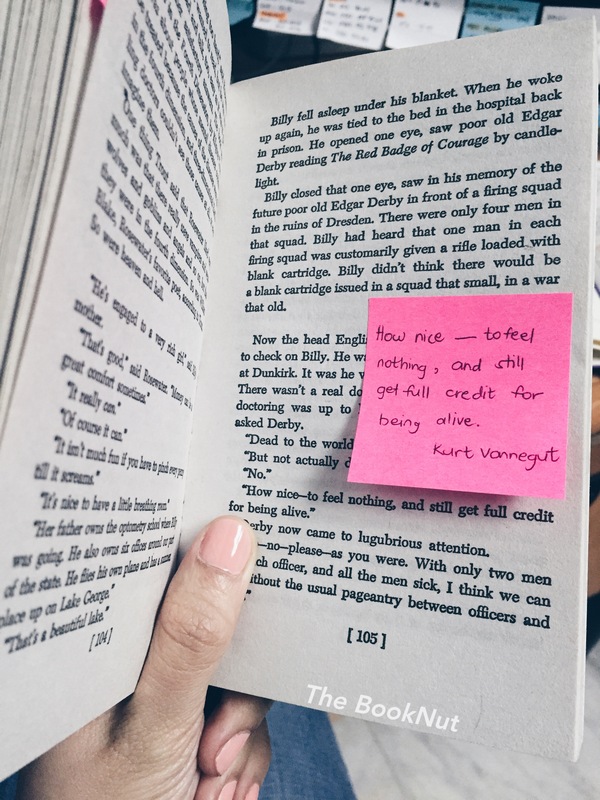 Another experience I had while reading the book is that I couldn’t help but feel like I was reading through Vonnegut’s experience in the war as oppose to just reading Billy Pilgrim’s fictional story. It was like I’ve interchanged the two and at some point not really knowing when I had no idea where Vonnegut stopped and Pilgrim begins. This was weird but yeah that’s what I felt. Kurt Vonnegut’s Slaughterhouse-Five is a good introduction to his body of work. It’s an amazing experience to be able to read through the works one of the most talented contemporary writers of this time.